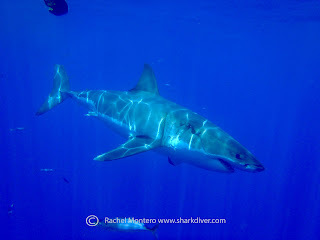 Shark Diver : Shark Diving : Swimming With Sharks: Great Whites: From the Eyes of our Divers! More Great Videos from this Season's Divers! "Seeing these creatures up close and taking this trip with you guys, exceeded my every expectation!" is a common response when we ask them... "how was it?" We have been receiving so many videos and awesome pictures from the divers on this season's trips! We love it! Every shark is different and so is each individual diver's encounter. They have asked us to share their adventures which have been captured in video and stills so that more people can see for themselves how incredibly mind-blowing swimming with these amazing animals can be. We thank them so much! We have linked you up with videos from two very excited divers, who just couldn't get enough. Click on their names to see what they saw. If you have taken a dive with Shark Diver, we encourage you to send us your videos or pictures so that we may share with those who tell us and you, "you're crazy!" If they saw what you have seen, we doubt they'd say that anymore.